info@USHGRS.org or other email address that one would know would reach us. "Stay true to the values of not having a political rating system or making personal comments. Take the high flight. Work on expanding the USHGRS database through reliable sources with the bare facts." The new Action Log looks like another milestone in the growth of the USHGRS web site. Also, very good advice from MG (not to be confused with MGF). SamKellner wrote: JoeF strikes again ! By the way, I see an important name missing from the "K" section. Yes, blink and you get left behind. That's a good thing ! Congrats on the success. USHGRS the way it should be ! 1. Does anyone really think that USHPA will last forever? When's the next crisis or dues increase? 3. How many pilots have lost their ratings due to getting tired of USHPA's bull and difficult to get the ratings back. 5. USHPA has become a paragliding magazine. OR scan your current USHPA card and save as an image. DougM wrote: I do not believe Joe is acting in our best interest. Joe's hidden agenda is NOT to help all of us pilots. His agenda is to make his club's presence appear bigger with more pilots than what it really has and is attempting to falsely legitimize his club. He is doing all he can to force us into joining his club. Swift wrote: Doug, you post freely in public spaces using your real name. I see your posts frequently in several places and no one is stalking you. There is no club. This is all about public record. DougM? wrote: Hidden agenda, false legitimization, outright thuggery. he is using a bully's and a thug's methods of doing 'business.' I will not be listed by you bullies involuntarily and by force! DougM wrote: At least I have the choice with the more professional organization. Swift wrote: What "more professional organization" would that be? You gave up hang gliding anonymity the moment you signed your name and jumped through hoops to your H 1 rating. You can't just be disappeared from history on your own wishes. You are part of the ether. You exist and you have entered an arena that USHGRS documents in a professional manor. You should appreciate that you are being freely recognized by the noble efforts of Joe Faust. Is it correct that you are age 59 and learning to fly? That is great. If I'm recalling a launch video attributed to you correctly, it was pretty powerful for such an old guy. Why would you not want to be noted for that instead of the childish whining that you are being bullied by attribution? Learn some history and grow some humility. And maybe at age 59, grow up. I love what Joe is doing and don't care so much what you are doing. At Robert Bradley's synergistic input of source code for a HG Pilot Send form moved USHGRS right along. A first draft form is ready for use. There will be refinements and appearance improvements. In the form you may give suggestions about the form; thank you in advance. Posted here on my last day of being 75. Friday I will wear 76. With data from the form feeding into a database, USHGRS busy-work will vanish. Kudos! We live in a time of choices in hang gliding. If you want a paid membership with ratings and a magazine, you've got USHPA. If you want a free membership with ratings and a forum, you've got the U.S. Hawks. If you want a free forum without ratings, you've got the Oz Forum or Jack's living room. And that doesn't even consider all the services offered by local clubs! The coolest thing is that you don't have to choose any one over all the others. 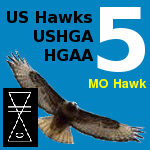 You can have ratings with USHGRS, U.S. Hawks, and USHPA. You can get USHPA's magazine and still participate in forums on ushawks.org, ozforum.com, and hanggliding.org. It's very cool!! That's the beauty of the free market. One of the few threats to this new freedom comes from those who want to suppress this information. Of course Jack Axaopoulos (sg) who runs hanggliding.org is at the front of that list. Jack is so desperate to keep a lid on these choices that he banned Joe Faust for simply posting about USHGRS. It's important to separate ratings from skills. Skills are hard won by one's own considerable effort. Ratings are just someone else's assessment of a person's skills. Skills will normally take time, effort, and sometimes money. Ratings, on the other hand, can be easy and convenient (USHGRS way).or a costly and annoying pain in the neck (often USHPA's way). My comment here was intended to say that the USHGRS rating system itself is about as easy as it can be ... even effortless. That makes no statement about what it takes to get those skills - which is usually a good bit more than effortless! It was a joy to read, and I found it through USHGRS. While I am disappointed that Jack Axoupolous (spurred by Doug Marley) banned Joe Faust for promoting the U.S. Hang Gliding Rating System (USHGRS), I have to say that I'm glad they'll both be remembered for their participation in that rotten deed. Just browse the pilot pages on USHGRS and remember that Jack Axoupolous banned Joe Faust for creating/promoting those same pages. Justice was never so poetically sweet.